Located in the prestigious area of Highgate Park @ Legacy Park, this 4 bedroom vacation rental with 3 bathrooms sleeps 8 guests and is perfect for a family getaway or a couple of friends vacationing together. Surrounded by green with lakeside views, this home will offer you both convenience and luxury at the same time. 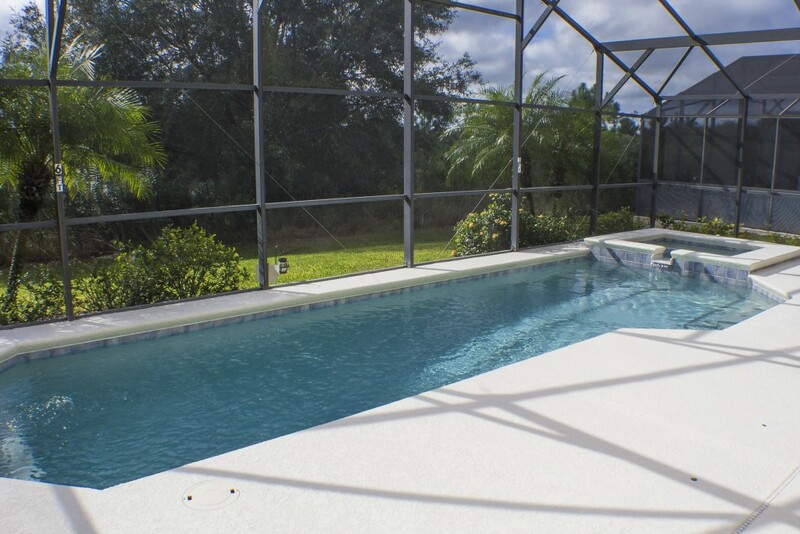 The single-storey pool home is a hit amongst everyone who stays there with the luxurious amenities and the excellent location which is not too far away from some of Florida’s popular attractions. 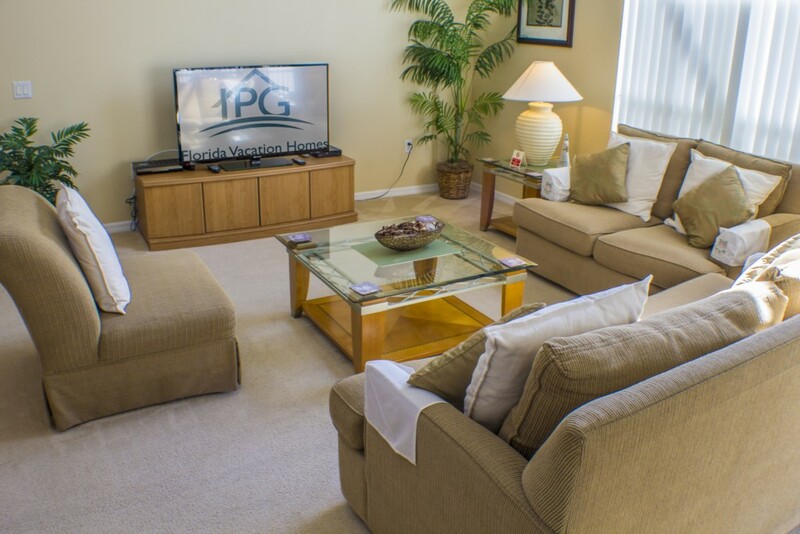 The lightly painted living room with high vaulted ceilings has a lot of natural light. 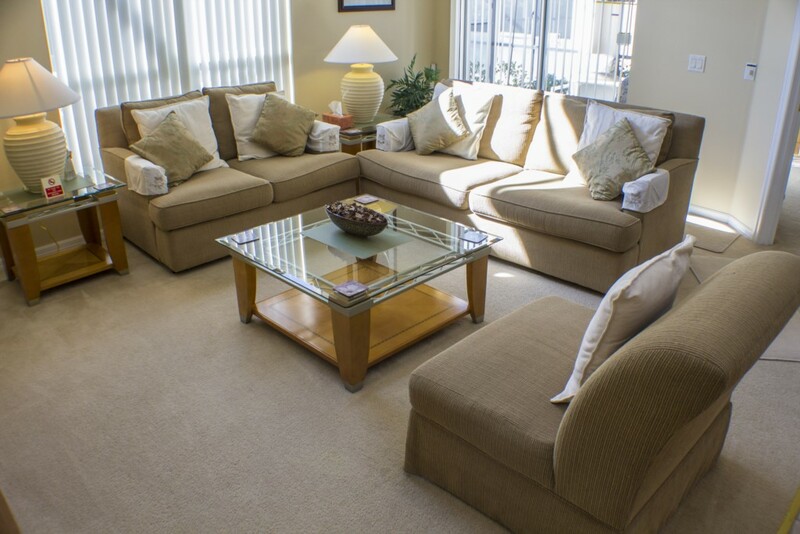 It’s comfortable and with its 3 sofas, there’s plenty of space for all guests to sit. The room is accented with rustic style wooden furniture and pot plants. You’ll be able to watch TV here or watch one of the many DVDs that the entertainment cabinet carries. The open plan kitchen and dining area is spacious and tiled. 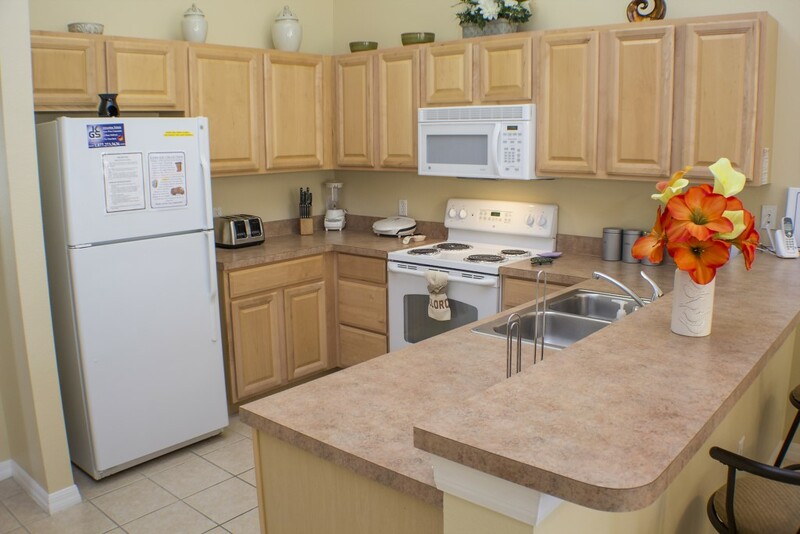 Decorated in creams and browns, this area is the perfect place to both prepare and eat your meals. 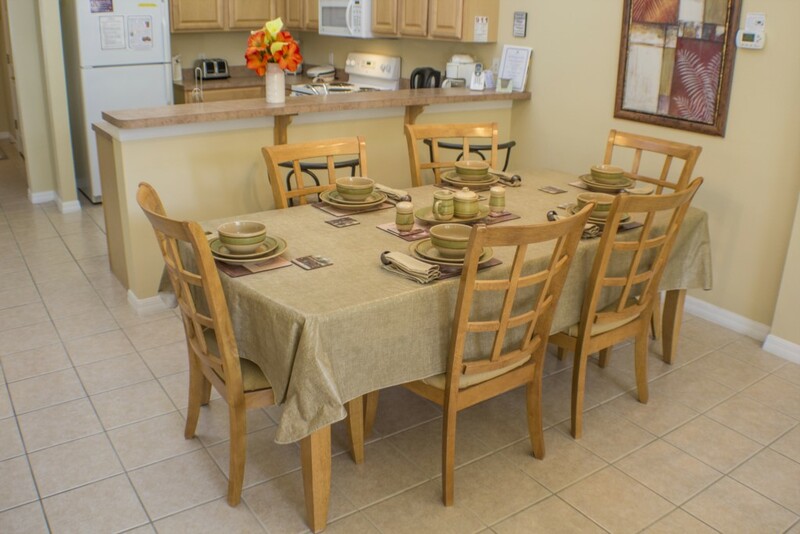 The large wooden table is perfect for family dining, and it can seat 6 guests at a time. 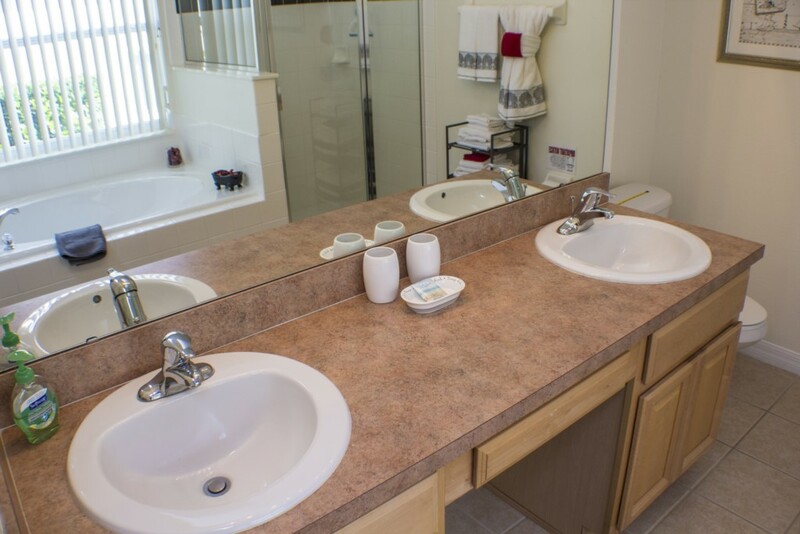 With mirrors adorning the walls and vases with flowers, you’ll really feel the special touches. There’s also a more informal area at the breakfast bar with 2 barstools. The master bedroom with large windows is simply designed and follows the minimalistic approach. 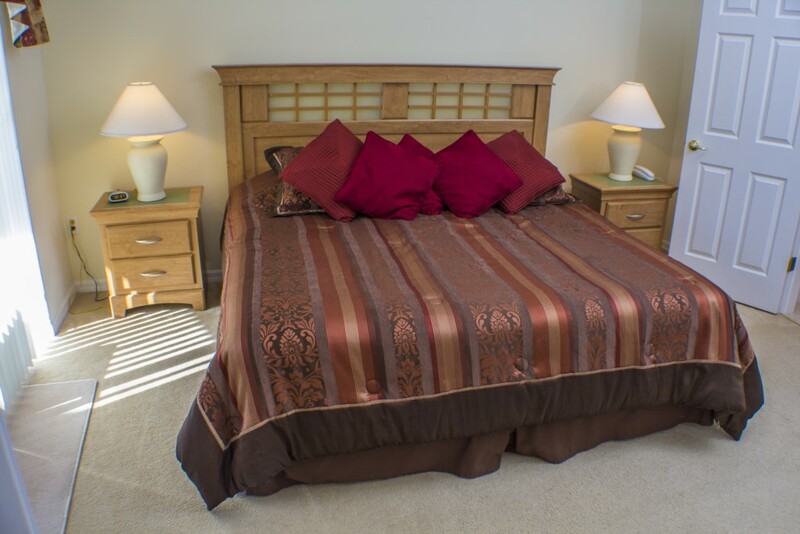 It has a comfortable king-size bed, bedside furniture, a large closet and the luxury of having its own en-suite bathroom. 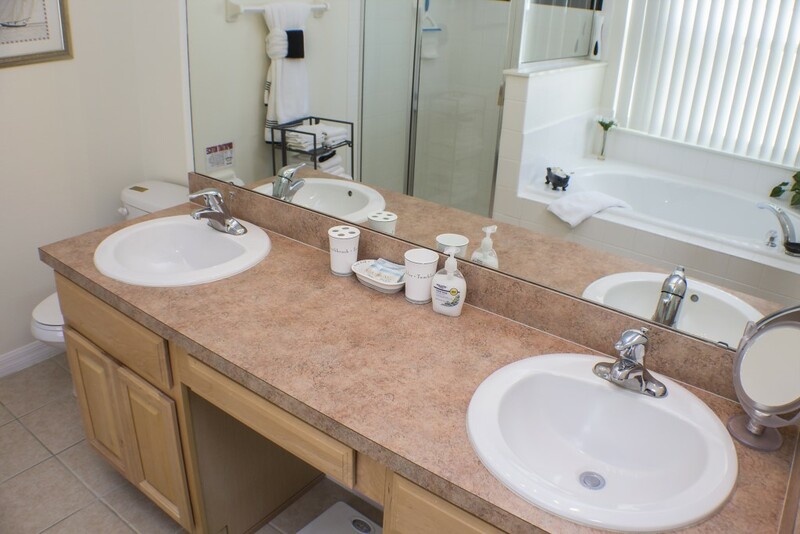 The bathroom’s large and comfortable; and it easily accommodates 2 guests with a double vanity, a deep bathtub, and a separate shower and toilet. 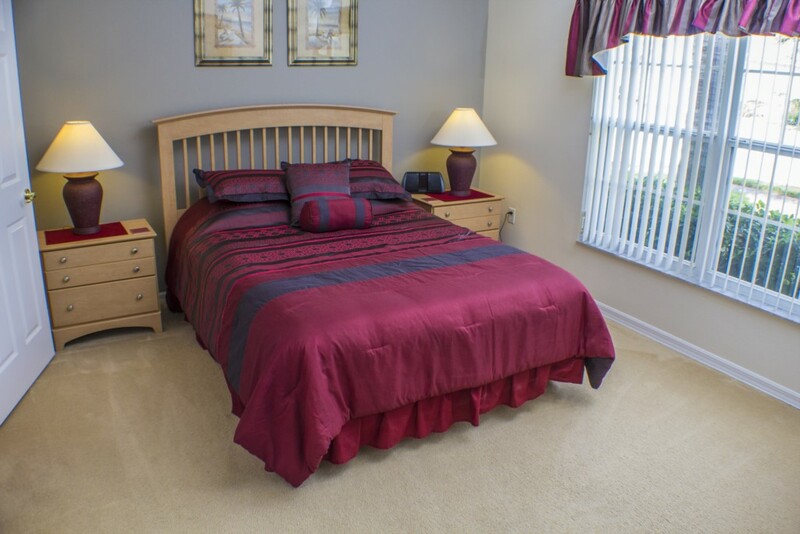 Similar in design, the second master bedroom has a queen sized bed. 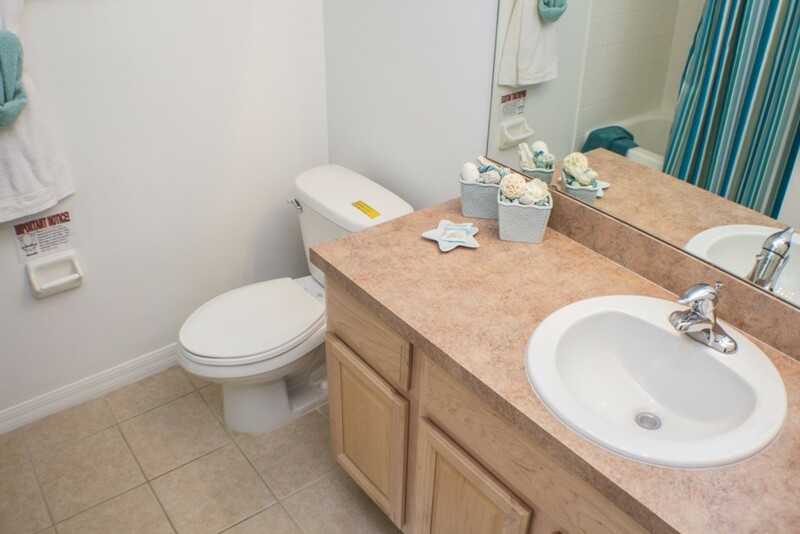 It also boasts its own en-suite bathroom with a single vanity and large closet space. 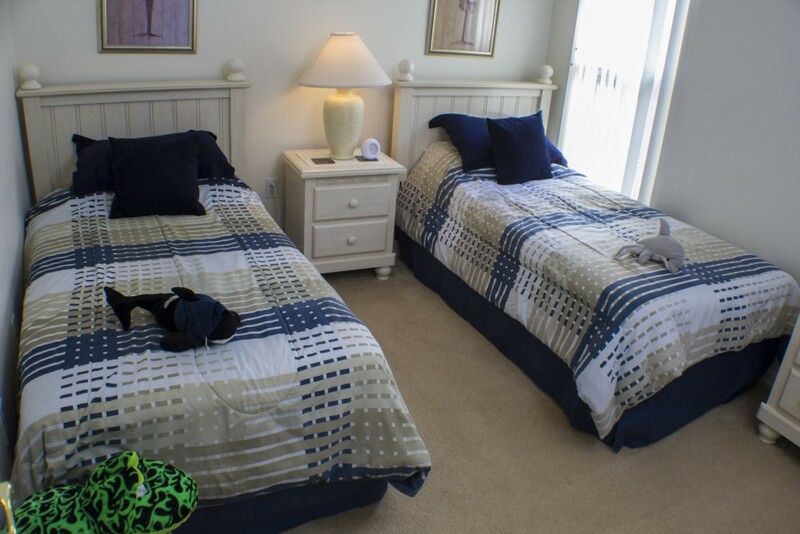 The 2 twin bedrooms are brightly colored. 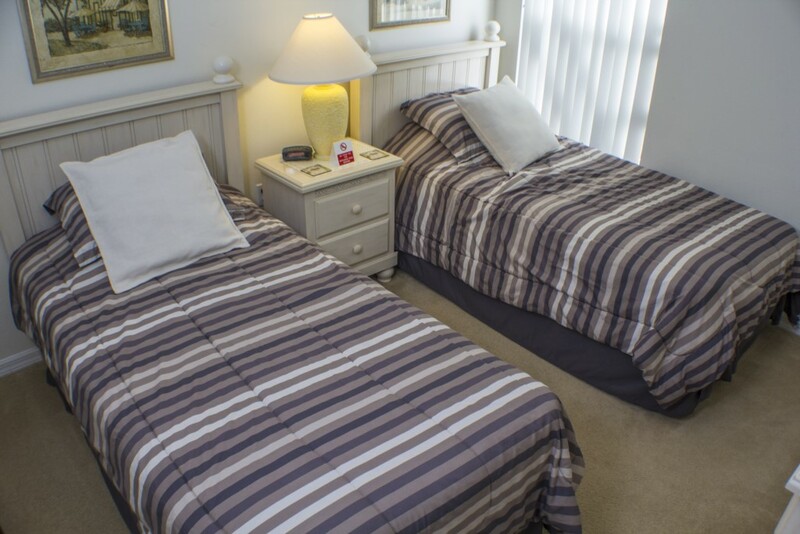 The soft beds are welcoming and each room has its own TV set. 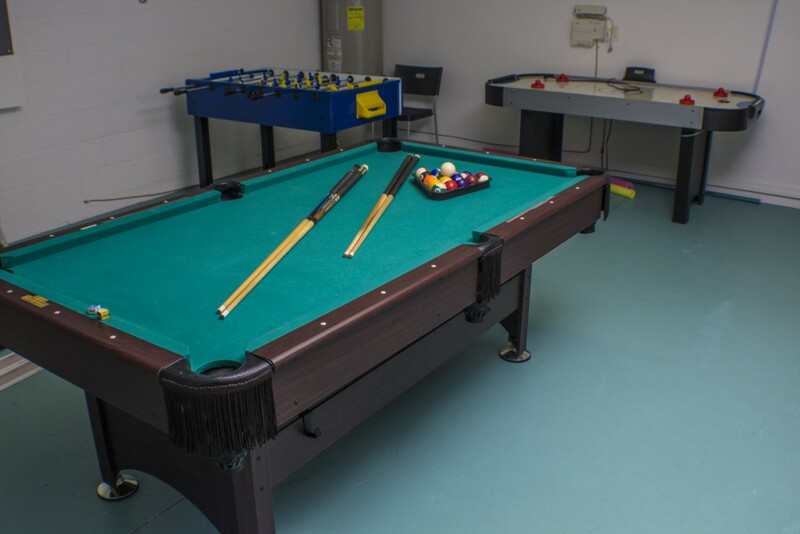 Kids and the young at heard will enjoy the games room where you’ll find a full-size pool table and an air hockey table in a well-lit spacious room. 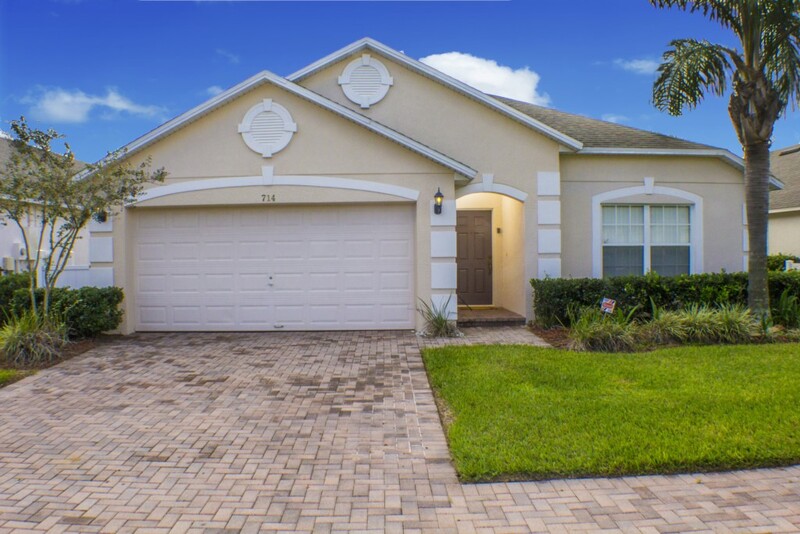 You and your family will love the outdoor patio area. 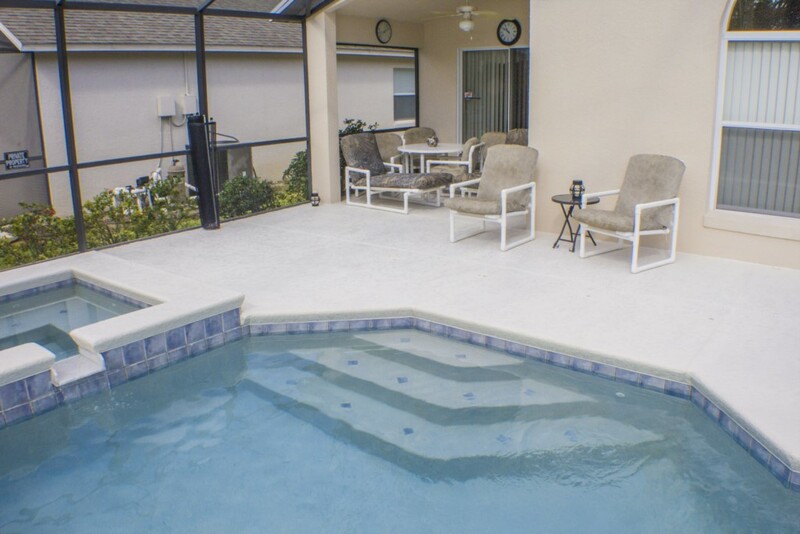 You’ll have your own private screened pool with adjoining Jacuzzi. The screening will give you the privacy you need, but at the same time you’ll be able to enjoy the green views beyond. The covered lanai area has a small outdoor dining area that seats 4. Or, if you want to catch a few rays and soak up the sun, you can relax on one of the sun loungers.